You'll be £13.50 closer to your next £10.00 credit when you purchase Flight Craft 16: The Hawker Hunter in British Service. What's this? The Hawker Hunter is one of Britain’s classic post-war jet aircraft. Initially introduced in 1954 as a swept-wing, transonic, single-seat day interceptor, it rapidly succeeded the first-generation jet fighters in RAF service such as the Gloster Meteor (see Flight Craft 13) and the de Havilland Venom. Powered by the then newly developed Rolls-Royce Avon turbojet, the Hunter’s performance transformed the RAF’s day fighter squadrons from the mid-1950s until the advent of the English Electric Lightning from the early 1960s (see Flight Craft 11). Even then, as successively improved variants of the type were produced with increasingly more capable engines and expanded fuel capacity, the Hunter successfully transitioned into a strike/ground attack fighter-bomber and fighter reconnaissance platform. Two-seat variants were developed for training and other secondary roles with the RAF and the Royal Navy and a few remained in use until 2001, albeit with specialised MoD Test and Evaluation units – well over forty years after the type’s initial introduction. Hunters were also famously used by two RAF display teams, the ‘Black Arrows’, who looped a record-breaking twenty-two Hunters in formation, and later the ‘Blue Diamonds’ as well as the Royal Navy’s ‘Blue Herons’. The Hunter saw combat service with the RAF in a range of conflicts including the Suez Crisis as well as various emergencies in the Middle East and Far East. The Hunter was also widely exported, serving with many foreign air forces, in which it also saw active service, which unfortunately lies outside the scope of this particular publication. Almost 2,000 Hunters were manufactured by Hawker Siddeley Aviation, as well as being produced under licence overseas and will remain one of the UK’s most iconic aircraft designs of all time. I love this book for its inspiration and motivation it's going to give you... fabulous ideas. Really high quality. Each section has some knowledgeable background text though the bulk of the content is made up from both black & white and colour images of the Hunter, and all with extensive and informative captioning. 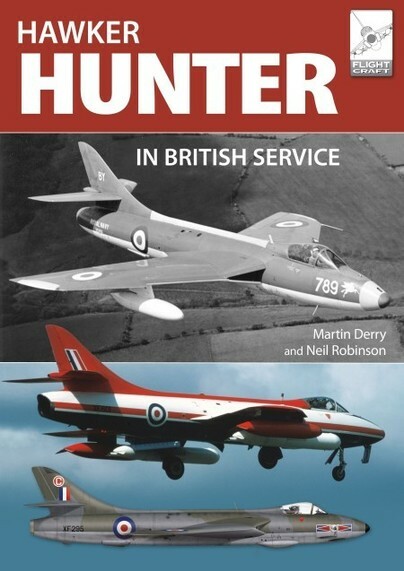 The long and varied career of the Hunter remains a fascinating story, and the showcase of completed models, in various scales, show some very nicely completed models. Plenty to inspire other modellers to try more of the Hunter in its' varied career. An excellent addition to the Flight Craft series.